The eastern Bering Sea supports one of the largest fisheries in the world: walleye pollock (Gadus chalcogrammus). The annual cycle of sea ice cover in the eastern Bering Sea influences ecosystem productivity via the formation of a cold pool of bottom water that varies in extent each year. Years with extensive cold pools are typified by energy-rich foodwebs, which favor walleye pollock and their preferred prey. However, multiple studies predict overall declines in the intensity and extent of cold pools under future warming conditions. Better scientific understanding of how ecosystem components interact enables ecosystem science to inform fisheries management practices that are robust to future warming. The Eastern Bering Sea (EBS) is a highly productive ecosystem characterized by a broad (>500 km) continental shelf (defined as <200 m) and narrow slope to a deep-sea basin (Fig. 1, Stabeno et al., 1999). Commercial fisheries in the EBS represent over 40% of fish landed annually in US waters, and the system has long supported one of the largest fisheries in the world: walleye pollock (Gadus chalcogrammus; hereafter pollock; FAO, 2017; Fissel et al., 2016). In addition to pollock, key commercial fisheries include King, snow and Tanner crab, Pacific cod, yellowfin sole, Pacific halibut, other flatfish, salmon and Pacific herring. The US federal government is responsible for sustainably managing the groundfish species, which include the bottom or near-bottom dwelling pollock, Pacific cod, rockfish and a variety of flatfish. While there is currently no commercial fishing allowed in US Arctic waters north of the EBS, there is awareness that warming oceans may extend the distributions of some fish species northward, increasing the potential for commercial fishing and associated vessel traffic (Cheung et al., 2015; Pinsky et al., 2013; Haynie and Pfeiffer, 2013). Fig. 1. The Eastern Bering Sea. The annual cycle of sea ice coverage in the EBS directly influences ecosystem productivity. Winter winds that bring cold arctic air and ice from the north into the Bering Sea affect the extent of the annual sea ice formation in the EBS and the timing of sea ice breakup in the spring (Hunt et al., 2002, 2011; Stabeno et al., 2012). The extent of the winter sea ice influences the formation and structure of the summer "cold pool", a body of dense cold water (<2° C) that remains on the shallow shelf bottom after the ice retreats in the spring (Fig. 2). In "cold" years with extensive winter sea ice, the cold pool extends south to the Alaska Peninsula; in "warm" years it does not extend far beyond St Matthew Island, a difference of about 800 km. The cold pool influences spring and summer oceanographic conditions (e.g., stratification) as well as the distribution of species that may have different tolerances or preferences for the cold bottom water. Thus, food-web interactions can vary each year as predators and their prey respond differently to the extent and location of the cold pool (Mueter et al., 2011; Stabeno et al., 2012; Sigler et al., 2016). Fig. 2. The annual extent of the cold pool of bottom water on the Eastern Bering Sea shelf from 2001-2017. Maps represent interpolated hydrographic observations and were developed by Carol Ladd (Siddon and Zador, 2017). The EBS experiences shifts between consecutive years of predominantly warm or cold conditions (i.e., years typified by small or large cold pools, respectively), which provide contrast to evaluate the drivers of biological productivity (Fig. 2; Stabeno et al., 2012). While phytoplankton blooms occur regularly in the spring, the duration and timing of blooms, as well as the sizes of phytoplankton, vary substantially between warm and cold years. These divergent bloom characteristics, in turn, influence the size and energy content of zooplankton prey (Hunt et al., 2011). In general, cold years are typified by large phytoplankton, which support higher abundances of krill and larger species of copepods, which themselves become energy-rich prey for their fish predators, including pollock. In contrast, during warm years there are more small-sized species of copepods, which are not as energy-rich. Feeding on energy-rich prey can improve fish condition and increase their overwinter survival rates. For example, when young pollock at the end of their first summer have high average energy content (a combination of energy density and fish weight), their overwinter survival is also higher (Siddon et al., 2017a; Heintz et al., 2013). In 2012, the EBS experienced the coldest average bottom temperature (Fig. 3) and largest cold pool since 1999, which provided an extreme case to test the hypothesis that cold conditions favor young pollock (Fig. 2). During the cold summer, the spatial overlap between young pollock and their preferred zooplankton prey appeared high (Siddon et al., 2017b). However, the pollock were much smaller than average at the end of their first summer. While their energy density was high, as is typical in cold years, their small size contributed to a low average energy content per fish, which led to the prediction of poor overwinter survival (Heintz et al., 2013b). However, current estimates of the pollock stock suggest that this 2012 year class of pollock may in fact be one of the largest in the past three decades (Fig. 4). 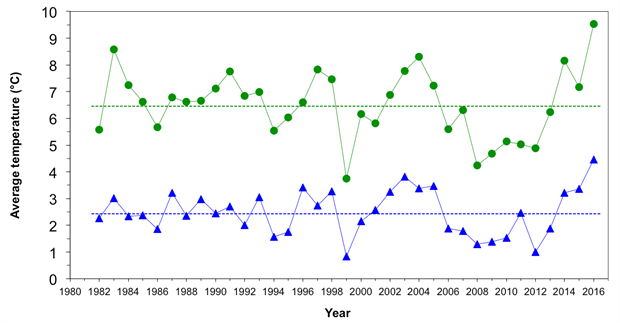 The 2012 year class now dominates the estimates of total pollock spawning biomass, which is currently at an overall high level and supports a large fishery quota (Fig. 5; Ianelli et al., 2016). Fig. 3. Average summer surface (green dots) and bottom (blue triangles) water temperatures (°C) of the eastern Bering Sea shelf collected during the NOAA Fisheries summer bottom-trawl surveys. Dotted lines represent the time-series mean for 1982-2016. From Zador and Siddon, 2016. Fig. 4. Recruitment estimates (the number of age-1s) for Eastern Bering Sea pollock from the 2016 stock assessment for all years since 1964 (1963-2015 year classes). Error bars reflect 90% credible intervals based on model estimates of uncertainty. From Ianelli et al., 2016. The explanation for the surprisingly strong 2012 year class remains uncertain and is an active area of study. Better scientific understanding of how ecosystem components interact enables ecosystem science to inform fisheries management (Zador et al., 2017). For example, despite the current high EBS pollock stock size, the fisheries managers selected a more conservative catch limit than the maximum permissible in 2016 (Federal Register, 2017). The justification for this reduction included the recent warm environmental conditions; low abundances of age-1 and age-10 and older pollock; the anticipated poor survival of age-0 pollock; the continued decline in acoustic survey estimates of krill, an important prey; and the continued declines in northern fur seals, which prey upon pollock. The current status of groundfish stocks in the EBS appear favorable overall. However, the longer-term effects of the recent, and record, warm years in the EBS will continue to be closely watched. Long-term climate projections for the EBS indicate significant warming of both surface and bottom summer temperatures, especially in the southern EBS shelf, as well as declines in sea ice extent in the winter and the extent and intensity of the cold pool. Concomitant shifts in productivity are anticipated; these shifts include declines in large zooplankton biomass, which may impact survival of groundfish species including pollock (Ortiz et al., 2016; Hermann et al., 2016). Multiple studies predict overall declines in pollock biomass in the EBS under future warming conditions (Ianelli et al., 2016b; Seung and Ianelli, 2016; Spencer et al., 2016). Fig. 5. Estimated Eastern Bering Sea female pollock spawning biomass. Biomass units are in thousands of tons. Data from Ianelli et al., 2016. Projected effects in adjacent large marine ecosystems will likely differ from those in the EBS, based on inherent differences in geography, oceanography, and food webs. For example, the adjacent Aleutian Islands ecosystem encompasses a long chain of islands with extensive nearshore habitat, a narrow shelf, and abyssal waters to the north and the south. Local ecological communities typified by rockfish (Sebastes spp.) and sea otters (Enhydra lutris) will not be able to simply shift their distributions northward due to the absence of nearshore habitat. North of the EBS, continuing winter sea ice cover, in spite of less spring sea ice (due to earlier breakup), remains a barrier to ecosystem expansions. This can influence the scope for fisheries and fishing communities to adapt to climate change. For example, the ability of pollock fisheries to adapt to reduced productivity in the south EBS and northward shifting groundfish distributions may be limited by continued winter sea ice and existing fishery closure areas that limit northward expansion of the fishery. Thus, understanding ecological and socioeconomic implications of climate-driven changes requires ecosystem-specific understanding of mechanistic processes and species physiological threshold (Pörtner and Farrell, 2008) to project trends in species and environmental conditions. Cheung, W. W. L., R. D. Brodeur, T. A. Okey, and D. Pauly, 2015: Projecting future changes in distributions of pelagic fish species of Northeast Pacific shelf seas. Progress in Oceanography, 130, 19-31. https://doi.org/10.1016/j.pocean.2014.09.003. FAO, 2017: FAO Global Capture Production database updated to 2015 - Summary information. http://www.fao.org/3/a-br186e.pdf. Federal Register, 2017: Final 2017 Overfishing Level (OFL), Acceptable Biological Catch (ABC), Total Allowable Catch (TAC), Initial TAC (ITAC), And CDQ Reserve Allocation Of Groundfish In The BSAI. Vol. 82, No. 37. Fissel, B., M. Dalton, R. Felthoven, B. Garber-Yonts, A. Haynie, S. Kasperski, J. Lee, D. Lew, A. Santos, C. Seung, and K. Sparks, 2016: Stock Assessment and Fishery Evaluation Report for the Groundfish Fisheries of the Gulf of Alaska and Bering Sea/Aleutian Islands Area: Economic Status of the Groundfish Fisheries Off Alaska, 2015. Stock Assessment and Fishery Evaluation Report, North Pacific Fishery Management Council, 605 W 4th Ave, Suite 306, Anchorage, AK 99501. Haynie, A., and L. Pfeiffer, 2013: Climatic and economic drivers of the Bering Sea walleye pollock (Theragra chalcogramma) fishery: implications for the future. Canadian Journal of Fisheries and Aquatic Science, 70(April), 841-853. https://doi.org/dx.doi.org/10.1139/cjfas-2012-0265. Heintz, R. A., E. Farley, and E. C. Siddon, 2013b: Fall condition of YOY predicts recruitment of age-1 walleye pollock. In: Ecosystem Considerations 2013, Stock Assessment and Fishery Evaluation Report, North Pacific Fishery Management Council, 605 W 4th Ave, Suite 306, Anchorage, AK 99501. Heintz, R. A., E. C. Siddon, E. V. Farley Jr., and J. M. Napp, 2013: Correlation between recruitment and fall condition of age-0 walleye pollock (Theragra chalcogramma) from the eastern Bering Sea under varying climate conditions. Deep Sea Res Part II: Top Stud Oceanogr, 94, 150-156. Hermann, A. J., G. A. Gibson, N. A. Bond, E. N. Curchitser, K. Hedstrom, W. Cheng, M. Wang, E. D. Cokelet, and P. J. Stabeno, 2016: Projected future biophysical states of the Bering Sea. Deep Sea Research Part II: Topical Studies in Oceanography, 134, 30-47. Hunt, Jr., G. L., P. Stabeno, G. Walters, E. Sinclair, R. D. Brodeur, J. M. Napp, and N. A. Bond, 2002: Climate change and control of the southeastern Bering Sea pelagic ecosystem. Deep Sea Research Part II: Topical Studies in Oceanography, 49(26), 5821-5853. Hunt, Jr., G. L., K. O. Coyle, L. B. Eisner, E. V. Farley, R. A. Heintz, F. Mueter, J. M. Napp, J. E. Overland, P. H. Ressler, S. Salo, and P. J. Stabeno, 2011: Climate impacts on eastern Bering Sea foodwebs: a synthesis of new data and an assessment of the Oscillating Control Hypothesis. ICES Journal of Marine Science, 68(6), 1230-1243. Ianelli, J., K. K. Holsman, A. E. Punt, and et al., 2016b: Multi-model inference for incorporating trophic and climate uncertainty into stock assessments. Deep Sea Research Part II: Topical Studies in Oceanography, 134, 379-389. Ianelli, J. N., T. Honkalehto, S. Barbeaux, B. Fissel, and S. Kotwicki, 2016: Assessment of the walleye pollock stock in the Eastern Bering Sea, Stock Assessment and Fishery Evaluation Report, North Pacific Fishery Management Council, 605 W 4th Ave, Suite 306, Anchorage, AK 99501. Mueter, F. J., N. A. Bond, J. N. Ianelli, and A. B. Hollowed, 2011: Expected declines in recruitment of walleye pollock (Theragra chalcogramma) in the eastern Bering Sea under future climate change. ICES Journal of Marine Science, 68(6), 1284-1296. Ortiz, I., K. Aydin, A. J. Hermann, G. A. Gibson, A. E. Punt, F. K. Wiese, and C. Boyd, 2016: Climate to fish: Synthesizing field work, data and models in a 39-year retrospective analysis of seasonal processes on the eastern Bering Sea shelf and slope. Deep-Sea Research Part II: Topical Studies in Oceanography, 134, 390-412. https://doi.org/10.1016/j.dsr2.2016.07.009. Pinsky, M. L., B. Worm, M. J. Fogarty, J. L. Sarmiento, and S. A. Levin, 2013: Marine taxa track local climate velocities. Science, 341(6151), 1239-1242. https://doi.org/10.1126/science.1239352. Pörtner, H. O., and A. P. Farrell, 2008: Physiology and climate change. Science, 690-692. Seung, C., and J. Ianelli, 2016:. Regional economic impacts of climate change: a computable general equilibrium analysis for an Alaskan fishery. Natural Resource Modeling, 29, 289-333. 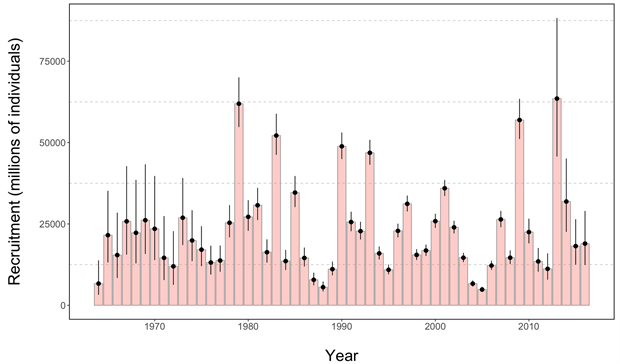 Siddon, E. C., J. T. Duffy-Anderson, K. L. Mier, M. S. Busby, and L. B. Eisner, 2017a: Seasonal, interannual, and spatial patterns of community composition over the eastern Bering Sea shelf in cold years. Part II: ichthyoplankton and juvenile fish, ICES Journal of Marine Science, fsx123, https://doi.org/10.1093/icesjms/fsx123. Siddon, E. C., et al., 2017b: (tentative title) Spatial overlap of age-0 pollock and their zooplankton prey. In: Ecosystem Considerations 2017: Status of the Eastern Bering Sea Marine Ecosystem, Stock Assessment and Fishery Evaluation Report, North Pacific Fishery Management Council, 605 W 4th Ave, Suite 306, Anchorage, AK 99501. Siddon, E., and S. Zador, 2017: In: Ecosystem Considerations 2017: Status of the Eastern Bering Sea Marine Ecosystem, Stock Assessment and Fishery Evaluation Report, North Pacific Fishery Management Council, 605 W 4th Ave, Suite 306, Anchorage, AK 99501. Sigler, M. F., J. M. Napp, P. J. Stabeno, R. A. Heintz, M. W. Lomas, and G. L. Hunt, 2016: Variation in annual production of copepods, euphausiids, and juvenile walleye pollock in the southeastern Bering Sea. Deep Sea Research Part II: Topical Studies in Oceanography, 134, 223-234. Spencer, P. D., K. K. Holsman, S. Zador, et al., 2016: Modelling spatially dependent predation mortality of eastern Bering Sea walleye pollock, and its implications for stock dynamics under future climate scenarios. ICES Journal of Marine Science, 73, 1330-1342. 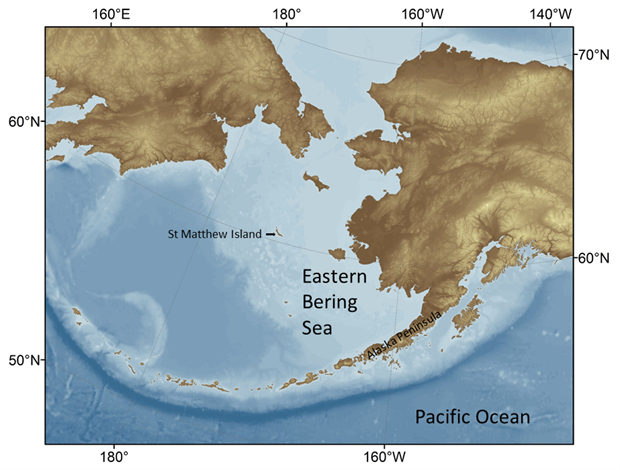 Stabeno, P. J., N. B. Kachel, S. E. Moore, J. M. Napp, M. Sigler, A. Yamaguchi, and A. N. Zerbini, 2012: Comparison of warm and cold years on the southeastern Bering Sea shelf and some implications for the ecosystem. Deep Sea Research Part II: Topical Studies in Oceanography, 65, 31-45. Stabeno, P. J., J. D. Schumacher, and K. Ohtani, 1999: The physical oceanography of the Bering Sea. In: Loughlin, T. R., Ohtani, K. (Eds. ), Dynamics of the Bering Sea: A Summary of Physical, Chemical, and Biological Characteristics, and a Synopsis of Research on the Bering Sea, North Pacific Marine Science Organization (PICES), University of Alaska Sea Grant, AK-SG-99-03, Fairbanks, Alaska, USA, pp.1-28. Zador, S., and E. Siddon, 2016: Ecosystem Considerations 2016: Status of the Eastern Bering Sea Marine Ecosystem, Stock Assessment and Fishery Evaluation Report, North Pacific Fishery Management Council, 605 W 4th Ave, Suite 306, Anchorage, AK 99501. Zador, S. G., K. K. Holsman, K. Y. Aydin, and S. K. Gaichas, 2017: Ecosystem considerations in Alaska: the value of qualitative assessments. ICES Journal of Marine Science, 74(1), 421-430.